More than just explanation … inspiration! 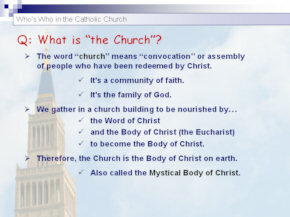 Description: Great for RCIA and other faith formation classes, this PowerPoint presentation explains the institutional, hierarchical structure and organization of the Catholic Church and the roles of everyone from the Pope to the Laity. Comes with a Catechist Guide, a class hand-out of definitions, and “The List of Popes“. Why do we say Peter was the first pope? What is the Pope – the Vatican – the College of Bishops? What is a diocesan priest, religious priest, brother, sister, nun, monk? What is a Papal Nuncio, Episcopal Conference, Cardinal? This is included in the PPT package. Add to the order only if you want copies for other uses in the parish or do not want the PPT. You may not post anything on the internet in any form. You may not add to or alter content without requesting and receiving special permission. PowerPoints are protected by a password to ensure that you will always have a good version if the editing goes awry or if someday someone gets their hands on the editable copy and adds things that a future DRE or catechist or pastor does not want there. You may obtain a customizable version, sans password protection, only after purchasing the original, protected version, for an additional equal cost. Mac users, you must have PowerPoint for Mac installed to run this. TechSoup has a special discount for churches. There are no hard copies, no CD or DVD to send you. Handouts are printer-ready PDFs. PPTs come in compressed (zipped) folders to be extracted to a computer or USB flash drive. 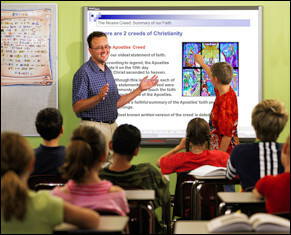 Our PowerPoint Presentations are easy to follow, inspire discussion, keep the interest flowing, and leave catechists room to add their own insights and knowledge. They include a Catechist Guide for easier preparation. ✓ accurate instructors on doctrine and teachings of the Catholic Church. “My students love your PPTs — they are easy for them to follow and very informative.” K.K. of Our Lady of the Lake Church in NJ. Each PPT comes with a single-parish license granting you permission to display the PowerPoint presentation in your classrooms, which provides unlimited use for unlimited years in one parish. Spanish versions of all our PowerPoint packages may be requested by special order when you don’t see it listed on the order form. Which PowerPoint Presentations cover what Sacraments? "The Nature and Function of the Church".